It seems like the whole world suddenly became obsessed with kale. Well, we like a leafy green just fine, especially when it’s cooked in duck fat. Hey, everything tastes better with duck fat. Just take your kale cooked, and in moderation. There’s been a few reports lately about the dangers of too much kale, especially when eaten raw. It’s best to cook it, and we suggest using duck fat to do that. It imparts a wonderful flavor and crispy texture. 1. Rip or cut the thick stems off the kale. Discard the stems. 2. Wash the kale and then dry it well in a salad spinner (or use pre-washed kale). 3. Rip the kale into chip-sized pieces and place in a large bowl. 4. Drizzle the softened duck fat, which should be a thick liquid consistency and toss to coat, using your hands to thoroughly mix it into the kale leaves. Try to use just enough duck fat to coat the kale, but not so much that the chips will be overly greasy. 5. 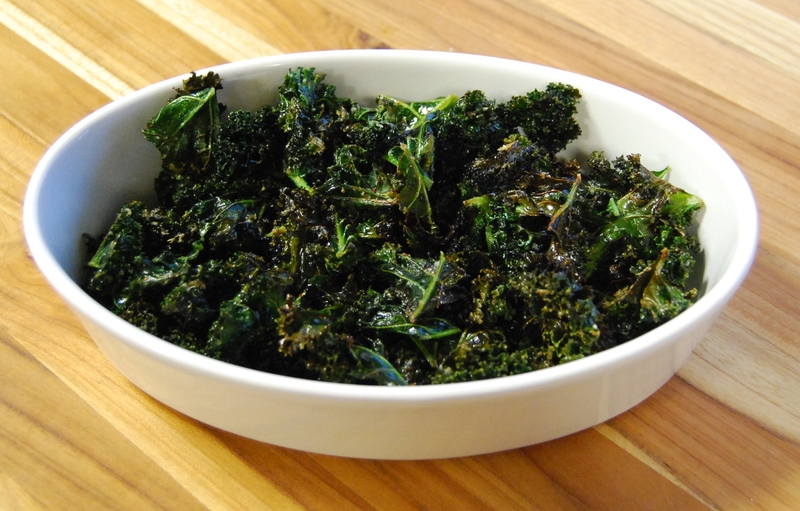 Place kale on a baking sheet in a single layer. Do not overlap or crowd the pieces. 6. Sprinkle with salt and piment d’Espelette, then Parmesan cheese. 7. Bake the kale chips in a 400 degree oven for about 9 minutes. Keep an eye on them – they go from baking to burning pretty fast. Here’s our little video to show you how.